EnergyCAP Quick Tip - How Can I Filter a Meter List Using Auto-Groups? We have been learning in recent Quick Tips about how to set up Auto-Groups and use them as filters for reports, Bill Lists, and Setup Sheets. But did you know that you can use some of those same Auto-Groups (in fact, any defined Meter Group) to modify your view of a Meter list? First things first. Most EnergyCAP users are used to seeing a representation of their building portfolio when they click Buildings and Meters. But did you know that you can actually "filter" the Buildings & Meters hierarchy (Tree View) to view only a list of the METERS that are members of a Meter Group that you select? You can click here to read the HELP topic on how to do this. EnergyCAP's powerful Groups functionality gives you the power to do precisely that! 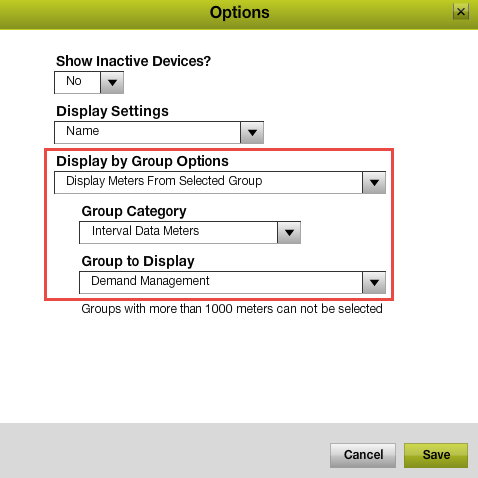 The first three examples above are already Meter Auto-Groups that are set up and maintained automatically by EnergyCAP. You can easily set up your own "top ten" Meter Group manually, and then use it for filtering your meter hierarchy. Try out this functionality yourself. It's a whole new way to look at your energy data! Take your energy analysis to the next level by using the power of groups, Auto-Groups, and exploring the meter list views in EnergyCAP.